Dogs, Goats and Llamas, Oh My! My family attended the Philadelphia Pet Expo for the first time this past weekend, and it was such a fun event! There were scads of vendors selling pet supplies, cute dog collars, cat toys and appetizing dog treats. Many local rescue groups also had booths, and brought with them some of the sweetest cats and dogs who need homes (as well as some rabbits, guinea pigs and even a few birds!) My son was thrilled to pet a friendly, tiny, older Yorkshire terrier, who was wearing a pink, sparkly sweater and in need of a good home. Attendees at the Expo can bring their own (friendly) dogs to the event, so the place was mobbed with canines of all shapes and sizes. I even saw some rare dog breeds out and about, such as two handsome Leonbergers. There was a booth for the Pig Placement Network, located in Sewell, New Jersey. 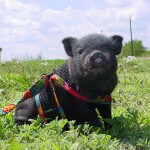 They brought an adorable and friendly 6-month old Vietnamese pot-bellied pig for adoption. From the PPN, I bought “pig art”, a creative concept where pigs use their paint-covered snouts to create a unique work of art. I could even pick the colors I wanted on my pig masterpiece, and the cost of the painting goes entirely to the Network as a donation. There was a petting zoo, complete with Silkie chickens (and Silkie chicks, which were a huge hit with my son and niece), a llama, Pygmy goats, sheep, rabbits and a tortoise. 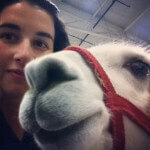 Goats and llamas are absolutely two of my favorite creatures, so I enjoyed petting zoo as much as the kids! I saw a booth for Rebound Pet Rehabilitation in Malvern, Pennsylvania where one of my veterinary school classmates helps to rehabilitate post-surgical dogs back to optimum health. Many of the local luxury boarding facilities, such as Wagsworth Manor, had a presence at the Expo. Wagsworth had even set up an indoor dog park for use by any of the dogs brought to the Expo by attendees. The highlights of the day were the dog and cat agility demonstrations. 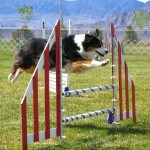 Several dogs competed to see which one could jump highest over a bar. The winning dog (a Border collie, of course) jumped over 48 inches! Cat agility was more humorous than athletic, with a cat trainer having a kitten follow a mouse on a string through an obstacle course. The Philadelphia Pet Expo was a big hit, and a great place for animal lovers of all ages. We look forward to attending the Expo next year.